On September 17, 1920, two men and one woman were killed at George Palmore's “Louse” Saloon on Bedford Street. Jackson James was responsible for the shooting to death of Mattie Green and Eugene Mallory. Jackson James was killed by Patrolman Clarence H. Roman with a single shot. One bystander, Raymond Armbruster, circulation manager of the Daily News, received a splintered bone above the kneecap. The affair was the result of jealously on the part of Jackson James. On July 1, 1910, Cumberland Police force received new summer uniforms of standard gray serge, summer weight, and pearl gray helmets. On November 1, 1910, the police force donned their new winter uniforms of blue cloth with blue felt helmets. 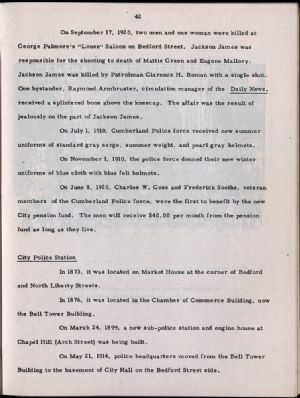 On June 8, 1920, Charles W. Goss and Frederick Soethe, veteran members of the Cumberland Police force, were the first to benefit by the new City pension fund. The men will receive $40.00 per month from the pension fund as long as they live. In 1873, it was located on Market House at the corner of Bedford and North Liberty Streets. In 1876, it was located in the Chamber of Commerce Building, now the Bell Tower Building. On March 24, 1899, a new sub-police station and engine house at Chapel Hill (Arch Street) was being built. On May 21, 1914, police headquarters moved from the Bell Tower Building to the basement of City Hall on the Bedford Street side.